I’m participating in Misty Mawn’s monochromatic art journal challenge and it’s been really fun! I got the dates mixed up, I was supposed to put 1-12 on the blue page and 1-13 on the Orange, but screwed up stamping the dates on…duuh, blond moment-again! I’m having fun manipulating photos of myself in Photoshop 6.0 and giving them artistic qualities. I can make them look like they were drawn with charcoal pencils or as if they were sketched and many other ways. The technique I used for the blue page was the ‘cut out’ feature using the Artistic Filter. I will also be drawing myself, too…but that’s for later. These are just the beginnings of my art journaling. 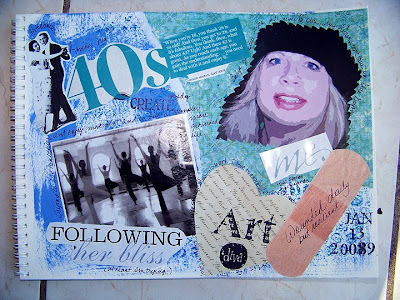 I’m also taking an online art journaling class with Kelly Kilmer. She gives us prompts to follow and the rest is based on our own creativity. Between these two journaling activities, I hope to improve my skills and develop better techniques and eventually get my own style going. I’m still working it all out and experimenting. 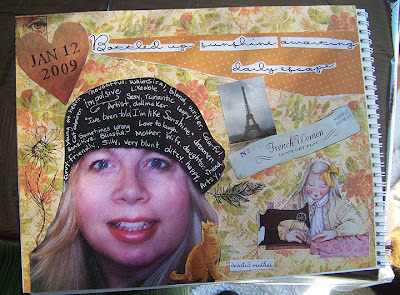 Everytime I create a journal page I think of something new I can do to embellish it. This is all a part of the process. The music I listened to while making the orange page is Diana Krall-The Look of Love. It’s very torchy, jazzy music and was perfect for how I was feeling at the time. Hope you enjoy looking at these. They are a fantastic way to pepper a little art into every day and doing that just makes my heart happier. Art is life. Next postSnowy Wednesday all white and Green? Love these pages Emily! I am a little behind on mine. Guess I should get off the computer and go make them. Isn’t it fun to do art with Misty! I like your work and your blog…the winter snow and neutrals are beautfiul.